I’ve been chuckling quielty to myself for the past couple of days over an article I read. Now that I have internet access, I’d like share it with you. The Kenya News Agency headline screams “Panic as Team Makes Abrupt Lands Office Visit”. Picture inspectors entering, bad civil servants fleeing out through the windows. Apparently this team of inspectors was responding to public outcry over delays in processing title deeds. The team found disorganization, a lack of a toilet for customers, and attempted to demonstrate Gemba Kaizen by 5S (Sorting) some files. The Kenyan government has adopted Gemba Kaizen to improve performance in civil service, according to the article. To me this is hilarious, in an absurdist sort of way. I imagined a scene of red-uniformed inspectors bursting in on a scene of fat cat bureaucrats doing nothing or worse. In British accents, “Right! We’re here from the Kaizen Squad! We’re here for the muda. Our chief weapon is fear. Fear and surprise. Fear, surprise, a ruthless efficiency…” And so on. On a serious note, this type of depiction of Gemba Kaizen, or any time of drastic change that is suddenly and violently imposed on people, gives kaizen a bad name. Who is responsible for teaching these Kenyans about kaizen like this? I have my suspicions but I won’t speculate in a public forum. Two points to the government of Kenya for taking kaizen to the gemba of the Lands and Housing Office. One point pentaly for using fear. But I’m willing to accept that perhaps a shock like this is needed in the early days of Lean government. Kudos, Government of Kenya! I’m having my first genuine 21st century moment sitting in an airport in Brazil, writing a Lean government blog entry about Gemba Kaizen in Kenya, over a Wi-Fi internet connection. Just five years ago, I couldn’t have imagined any of this. I was leading the Waste Free Kenya Campaign. It was a 6 month pilot to apply Kaizen for Muda Elimination using my own 3P model for 26 Govt. ministries. 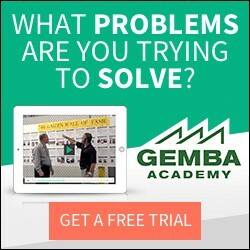 Something went wrong & a few guys who were charged by the cry – go to the Gemba!! – probably went wild – I was not there, so don’t know. Otherwise the Govt of Kenya & our team of consultants did a good job! Thanks for your contribution. It’s great to get some insight on what is happening with kaizen in the Kenyan government. Keep up the good work!